Allan R. Bevere: It's Not My Faith. It's Not Your Faith. It's Our Faith. It's Not My Faith. It's Not Your Faith. It's Our Faith. On this All Saints' Day we are reminded that none of us lives as a solitary Christian. As the saying goes, "There are no Lone Rangers in Christianity." Without the saints-- the saints we know personally and the ones we only know by reputation-- we could not be Christians, we could not be the church. Of course, it is true that each of us must personally appropriate and embrace the faith. Christianity cannot simply be observed from a distance. But as individuals we can never own the faith; rather the faith owns us. We modern Western individualists speak of having Jesus as our own personal Savior as if he is some property we have acquired. It should be noted that the New Testament writers do not use such language. Only twice does St. Paul say anything that might remotely be construed as the language of an altar call (Colossians 1:27; Galatians 4:19), and even there he is not embracing an all-sufficient individualism which reduces our faith to a self-focused country music rendition of "Me and Jesus." Paul much prefers to speak of believers not having Christ, but being "in Christ" (e.g. Romans 8:1; Colossians 2:10). In receiving the Christian faith we are also given the Christian faith. It is a faith that is once for all entrusted to the saints (Jude 1:3) In receiving this faith already given, we are given the gift of not having the burden of making it up on our own. We do not have to fret about whether or not we are intelligent enough to figure out our discipleship all by ourselves. The wisdom of the saints embraces us on this journey that countless have already walked are walking now and will walk long after we join the church triumphant. There is comfort in knowing that I simply can receive as a gift what I can never obtain on my own. Yes, it is true that this faith we receive is to be pondered over, it is to struggled with, it is to questioned, not because we think we individual Christians in the 21st century can do better than our forebears, but rather because we get to join this great two thousand year conversation. And in pondering, struggling, and questioning we get to contribute to this faith that is all of ours. In so doing, we are given the opportunity to give the gift of our faith to future generations. We make it possible for those generations to stand on our shoulders. We do this in gratitude for the gift of previous saints on whose shoulders we stand today. Therefore, since we are surrounded by so great a cloud of witnesses, let us also lay aside every weight and the sin that clings so closely,* and let us run with perseverance the race that is set before us, looking to Jesus the pioneer and perfecter of our faith, who for the sake of* the joy that was set before him endured the cross, disregarding its shame, and has taken his seat at the right hand of the throne of God (12:1-2). 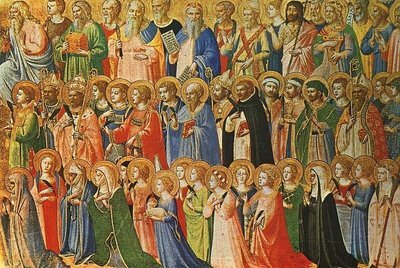 On this All Saints' Day we must remember the saints who having received the faith have now passed it on to us. We journey toward what they have now received. O blest communion, fellowship divine, We feebly struggle, they in glory shine; Yet all are one in Thee, for all are Thine (For All the Saints). Yes, indeed... we are in Christ. And when we are in Christ we are by necessity in the church... or better... we are church. Jesus and the church go together. On this All Saints' Day, what God has joined together, let no one separate.